Narendra Modi has been wise not to let Pakistan and Pulwama ruin ties with Saudi Arabia. And he's only pursuing a Manmohan Singh initiative energetically. There’s been much debate on diplomatic protocol involved in Saudi Crown Prince Mohammed bin Salman’s (MBS) visit. The fact is, protocol is no longer a compulsion. It is, instead, a sign language in which nations often speak to each other. That’s why Canadian Prime Minister Justin Trudeau gets an unknown junior minister of state to receive him, but leaders from diverse powers have been greeted by Narendra Modi. These include US President Barack Obama, Israeli Prime Minister Benjamin Netanyahu, Sheikh Hasina of Bangladesh, Prime Minister Shinzo Abe of Japan, Crown Prince Mohammed bin Zayed of UAE (twice), Jordan’s King Abdullah-2 and now the Saudi Crown Prince and strongman Mohammed bin Salman. Trudeau was sent a message about his party’s persistent insensitivity to Indian concerns on Sikh radicalism. On the contrary, others were told they were special friends. That is how modern heads of state talk. Donald Trump even conducts high diplomacy on Twitter. Modi was wise to go to the airport to greet MBS, and not create discord and do “nakhrebaazi” over his visit within 48 hours of his having said wonderful things about Pakistan in Islamabad. Further, having gone to receive the Jordanian king and the UAE Crown Prince twice, if Modi hadn’t gone for the Saudi, it would have been an almighty insult. Strategically, for India, Saudi Arabia isn’t quite Israel. But it is the most important power in the Islamic world, and of great significance to India. Along with China and the UAE, it is one of the three friends with influence over Pakistan. 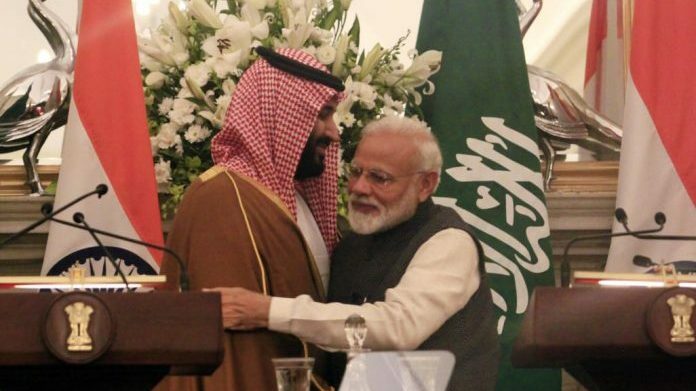 Modi has been criticised on three broad counts: One, that MBS had just signed a joint statement with Pakistan that India should be protesting. Two, that he promised Pakistan $20 billion investments (not aid). And three, that he faces global opprobrium, especially in Europe, because of his widely-suspected role in Washington Post columnist Jamal Khashoggi’s murder. You could have gone on to add Saudi support for Wahhabi indoctrination around the world, its world championship of executions by public beheadings. Should a secular republic be lionising a feudal despot from the world’s most patriarchal theocracy? Now, Saudi Arabia did not become like that lately. It’s always been what it is. Its ruler carries the exalted title of “Guardian” of Islam’s two holiest places. It has a theologically puritan view of Islam that exclude tens of millions of Muslims, especially Shia. Can India change it? There is one thing India could change, and that is the one that matters. It could lessen the older distance, near-hostility, pro-Pakistan slant of the Saudis. And wait, before you line up your verbal AK-47 and execute me on charges of being a Modi fan — it was Manmohan Singh who truly launched this pragmatic politics. Singh had the intellect to know that the way to shift the power balance with Pakistan wasn’t just to de-hyphenate America’s policy in the subcontinent. India also needed to hyphenate itself with Pakistan’s closest friends: China, the UAE and Saudi Arabia. There’s a fourth, Turkey, but India never had much leverage there. Not long after taking over, Singh took the audacious step of inviting Saudi King Abdullah bin Abdulaziz as the chief guest on Republic Day in 2006. And you know what? He broke that ruddy protocol too, by going to receive him at the airport. Hugging wasn’t his style. Feudal societies have a million problems but they also reciprocate respect and honour. So, when Singh went to Saudi Arabia in 2010, the first Indian prime minister in 28 years, guess who received him and how? It was then Crown Prince Sultan bin Abdulaziz, with the entire Saudi Cabinet, chiefs of armed forces and most of the royal clan, including a young MBS. Just researching on that visit with the help of my young colleague Srijan Shukla, I discovered another juicy nugget for protocol-lovers. At Riyadh (airport), the Saudis gave a special welcome to Singh by rolling out the red carpet instead of the usual green — breaking protocol. Later that year, when MBS (though not yet the de-facto ruler as now) came to India, he was received by vice-president Hamid Ansari. Read those effusive speeches by Singh, in Riyadh and Delhi. Despite trade and cultural ties of over 5,000 years, when Singh said in his Riyadh speech that ships made of teak sailed between the coasts of Kerala and the Arabian-Persian Gulf, there had been unease between India and Saudi Arabia. Singh eased that. We celebrate our strategic partnership with America. But remember, it was Singh and the King who initiated the India-Saudi strategic partnership. Result: In 2012, the Saudis turned over Abu Jundal, the handler of the 26/11 LeT attackers in Mumbai. The other Gulf states, especially the UAE, are routinely handing terror and corruption fugitives over to India. At last count, since 2012, the number was 18. This is a strategic turnaround, and the reward of a bipartisan Indian political effort. Both P.V. Narasimha Rao and Atal Bihari Vajpayee had struggled over Kashmir because of the hostility in the Islamic world. There were routine, and embarrassing, resolutions of the OIC (Organisation of Islamic Countries) on Kashmir. The rise of the Gulf Cooperation Council (GCC) marginalised the OIC. India has taken advantage of it by reaching out to the Gulf powers while preserving its special and vital relationship with Iran too. This game has been played brilliantly by three successive prime ministers — Modi being the third. Again, check the result: First, the GCC started acknowledging Kashmir as a bilateral issue. Now, at its last two summits, Kashmir hasn’t found a mention. Is everything now perfect between India and Saudi Arabia? The answer is no. Is it enormously better than in the past? The answer is yes. There are fundamental conflicts of strategic interest between New Delhi and Riyadh. Pakistan is Saudi Arabia’s closest Islamic friend. Its soldiers often form the most trusted core of the Saudi armed forces, even for the royal family’s security. It would be silly of India to expect the Saudis to dump the only nuclear-armed Islamic nation with probably the largest Sunni population in the world, which shares long borders with Iran and Afghanistan. Similarly, India has a close strategic relationship with Iran and a cordial one with Qatar. Both countries are today the biggest enemies for the Saudis. But pragmatic nations happily accommodate each other’s concerns without sacrificing theirs. That’s why MBS publicly cursed Iran as a terrorist state in Pakistan, but refrained here, not to embarrass his Indian hosts. India, at the same time, reciprocated by not demanding he name Pakistan for Pulwama and terror. We are often critical of some of Modi’s foreign policy moves, the limitations of an overly personalised ‘hugplomacy’, which I have written about it in National Interest. But you must also give him credit for managing the Gulf relationships in a pretty good manner. Too much hugging may throw an Emmanuel Macron or Trump, but it works with the big feudals. Modi was wise, therefore, not to let Pakistan and Pulwama ruin this pre-scheduled visit. India has worked for two decades to de-hyphenate the US policy on India and Pakistan. It will be so incredibly stupid now if we aren’t able to decouple our own worldview from Pakistan. Leave drama to your commando-comic TV channels. Incremental gains are a great reward in diplomacy. All this is fine, you might ask, but what about the brutal murder of Khashoggi? My suggestion is, do Google one Sergei Magnitsky when Vladimir Putin comes visiting next. What is the proof of these imaginations conceived in the article? This is a brilliant piece by Shekhar in the national interest and Congress party should definitely read this. There is no doubt that successive governments have done well to improve our relations with GCC countries and Modi has done well to visit Isreal and Palestine as well. Today, Isreal, GCC including Qatar and Iran are good friends with India, thanks to Modi. Modi has been mature enough to de-hyphenate Phulwama from MBS visit to Pakistan and focus on strategic aspects with Saudi. In fact, India should now learn to behave like a big country and punish Pakistan without looking for support from any other countries. The world will respect us if we do so on our terms and not look to them for support. While we should make all diplomatic noises, it is our hard actions on our strength will be required. Isreal or China will not cry and look around for support when its interest are affected, they will hit the enemy hard. Pusillanimous behavior by India in the past is the reason why Pakistan takes us for granted. An excellent summation, as always by Shekhar Gupta, of Real Politik! Why to fritter away energies and time over trifles questioning protocol or breach of protocol ? the big one with Trump ! is trying every damn trick up his sleeves ! Never mind Congress objections and jibes on either the hug or the reception. THIS is exactly how a Congress/UPA, or whatever else, PM would have received MBS. They are taunting Modi because they have run out of the Rafale steam and they have NOTHING else on their plate. Sheer hypocrisy, that’s all. And thus marches on another pen soldier of the Modi Shah brigade, maybe a counter part to Tavleen Singh. Your recent writings, interestingly all onModi, make for an enlightening reading. Here is a sample – Rafael is no scam just minor issue in messed up communication from govt, opposition doesn’t have a leader, Modi impleemented great economic initiatives, and so on. Do you see any real fault in the great leader? Any at all? Or Would you go on to suggest whole country to start reading Adventures of Bal Narendra? No , whole country should only read Adventures of Bal Rahul, and now Balika Priyanka too !!! Nice article with depth in analysis! All your past examples are fine and agreed that it was MMS who broke protocol in national interest. Its not necessary that he follow him as if he follows his other good qualities. If you and team how Modi was critical of every and even good actions. Having said this I am not saying that what Congress has said is right. But in the national why could not have broken the protocol and shared his anguish the way our jawans were killed by Pak sponsored act. Main reason for India pampering the Saudi kings is that they are the employer of more than 3 million Indians who remit perhaps more than 10 billion dollars to India every year. Only one Muslim country in the world has nuclear weapons, and that is Pakistan, and that is a Sunni country; Saudi Arabia too is a Sunni country; Pakistan is poor, SA is rich. If two pieces of a jigsaw puzzle were to fit nicely, they couldn’t have fitted more nicely than P and SA. Abdul Qadeer Khan used to say that Saudi Arabia wanted to buy a nuclear weapon from Pakistan like we buy shampoo off the shelf. Intellectuals and diplomats can do torrential brain storming over what SA ought to say to P about terrorism, or what SA should say about P’s role in another P, which is Pulwama, in a joint statement in India etc — all this is insignificant chatter like corona chatter between two electric lines in a silent night. Nothing can change the tight bonhomie between Saudi Arabia and Pakistan. When Imran Khan personally drove prince MBS in his car, I am sure they wouldn’t have talked about the agenda of the talks and mundane stuff like that. Who knows, Imran Khan might have regaled the young prince with his mischievous nights in London when he also played cricket! One constructive takeaway is that foreign policy outlives administrations. A lot of thought and creativity have gone into forging mutually beneficial relationships – including the one with Saudi Arabia – which at one time may have seemed a little implausible. Acknowledging from time time, on appropriate occasions, good work done in the past is a graceful thing to do. India has always been respected in most parts of the world for being much more than the sum of its parts. That was not about individuals, although no one has done more to raise India’s stature in the eyes of the world than PM Jawaharlal Nehru.